李超, 张智, 夏桂华, 等. 基于强化学习的学习变阻抗控制[J]. 哈尔滨工程大学学报, 2019, 40(2), 304-311. DOI: 10.11990/jheu.201803020. LI Chao, ZHANG Zhi, XIA Guihua, et al. Learning variable impedance control based on reinforcement learning[J]. Journal of Harbin Engineering University, 2019, 40(2), 304-311. DOI: 10.11990/jheu.201803020. Abstract: To improve the performance of force control and enable robots to learn how to execute force control tasks autonomously and efficiently, this paper presents an efficient variable impedance control method. The proposed method learns the optimal impedance regulation strategy using a model-based reinforcement learning algorithm. The Gaussian process model is used as a transformation dynamics model in the system. This model permits probabilistic inference and planning. Also, an energy consumption item is added to cost function to achieve a trade-off between error and energy. The simulation results show the efficiency of the proposed method, requiring only a few interactions to successfully learn how to complete force control tasks. Furthermore, the required number of interactions and interaction time are significantly reduced. The learned impedance control strategy features bionic characteristics, which are applicable in learning how to perform force-sensitive tasks. 付春江, 王如彬. 人体手臂阻抗控制研究[J]. 力学季刊, 2010, 31(1): 37-45. 黄瑞, 程洪, 郭宏亮. 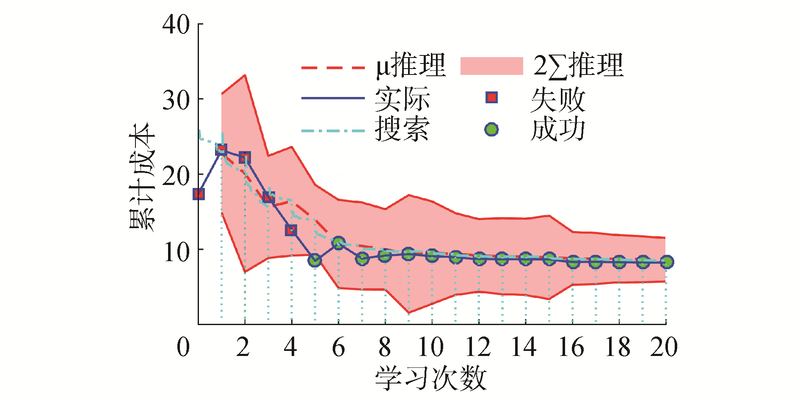 基于增强学习的下肢助力外骨骼虚阻抗控制(英文)[J]. 电子科技大学学报, 2018, 47(3): 321-329. 邱静, 陈启明, 卢军, 等. 下肢助力外骨骼机器人自适应阻抗控制研究[J]. 电子科技大学学报, 2016, 45(4): 689-695.